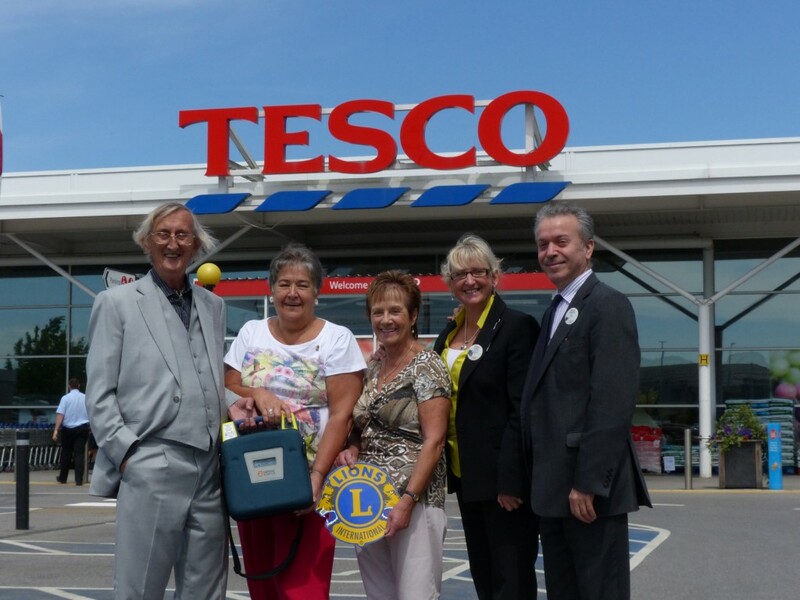 16 July 2014 – A life-saving defibrillator has been installed in Helsby’s Tesco supermarket – thanks to local community group Helsby & Frodsham Lions and Councillor Les Ford. A defibrillator is a device that is used to shock a person in a cardiac arrest, it is very easy and safe to use and will only shock someone if they require it. Recent research and study has shown that someone who has a sudden cardiac arrest and is administered a shock, has a much improved chance of survival than someone who is not shocked. An effective response time to administer the shock is under eight minutes which is why installing them in public locations is vital. The defibrillator was joint-funded by the Lions and Councillor Ford and is now in situ at the supermarket. Local member, Councillor Les Ford, said: “Getting the right medical treatment quickly following a cardiac arrest is vital and so I was delighted to be able to help ensure that a defibrillator was fitted in such a public place. Tesco Helsby Manager Khosrow Sofla said: “Here at Tesco, in Helsby, we are delighted to announce that the Helsby & Frodsham Lions and Councillor Les Ford have provided a defibrillator to be made available in store for the local community, in the event of an emergency. Could you help save someone’s life by learning how to use a defibrillator? Heart Start courses will be available and open to anyone. The Heart Start Scheme is registered with the British Heart Foundation, supported by the Cheshire Chain of Survival and all training is being provided by the Northwest Ambulance Service. The Helsby & Frodsham Lions are part of Lions Clubs International, an international service organisation which fundraises to support needs locally, nationally and internationally. In the last year they have supported a local student in a Younglife International project in South Africa; Helsby Pre-School with their Fundraising Appeal; Helsby High School Sports Trophies; Frodsham Royal British Legion; Save the Family; Christmas Hampers in Frodsham, the Hospice of the Good Shepherd. They also supported a community project involving Will to Work Workshop in Frodsham and Weaver Vale Primary School by providing the materials to build a library corner and bookshelves. Nationally they have donated to the SW Flood Appeal and internationally to the Philippines Disaster Appeal. The monies are sent immediately, to wherever it is required, without the involvement of bureaucracy, therefore helping the needy more speedily. For more information about Lions Clubs International contact mplusm@talktalk.net or telephone 01928 722121. Councillor Les Ford, Margaret Marsh and Judy Stewart from the Helsby & Frodsham Lions and Tesco’s Cathy Mercer and Khosrow Sofla.